Judy Blume will be speaking at the University of Hartford on June 21st as a fundraiser for The Mark Twain House & Museum. I’ll be interviewing her onstage and taking tons of audience questions. In preparation, I will be reading her complete works and blogging about the experience. Get your tickets here. I once went up to the top of the high dive at our public pool and refused to jump off. The lifeguard, probably a high schooler, tried to tell me I had to jump, but I didn't. I sat down on the board and scooted my way back off, then walked down the ladder. This was completely against the rules, but my fear of the height was greater than my fear of the lifeguards. Already soaking wet from the day of the pool, I skedaddled down to the side and make it seem like I'd already come out of the water from my big jump by the time my best friend surfaced from her jump. I didn't lie, per se, but I definitely did not say anything about being too scared to jump. 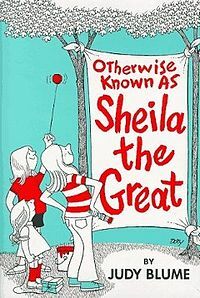 Otherwise Known as Sheila the Great is a great book. I'm going to go out on a limb here-- heights or no heights-- and say this one is my favorite so far. At this point in her writing life, Judy Blume had started to hit the comedy nail on the head. With Sheila, she finds the perfect balance between a comedic tone and the everyday fears of real kids. Sheila is afraid of spiders, thunderstorms, swimming, and dogs-- but she still lives with the joy and boldness of any ten-year-old kid. She's all bravado, a completely unreliable narrator. If I had a kid who was afraid of things, I'd read them this. Actually, in the end, I am still a kid who's afraid of things. And actually, I have a significant amount of bravado as well. Recently I found myself jumping off a twenty-foot platform into a lake. When I got to the top I didn't want to do it. I turned to walk back down the ladder-- but the shame of not completely the jump was worse than the fear of just jumping. I stepped off. I jumped. I was still afraid. I hit the water. I lived. Sheila does not overcome her fears by the end of the book. She has to deal with them over and over. She learns to swim just a little, she gets a puppy. She lives in the world with her fears. She takes tiny, tiny steps towards being less afraid. That's what we all do every day. Thanks, Judy, for pointing that out.